Chester was noted for its Roman ruins and has a Roman amphitheatre where state and religious special events would have been held. This sometimes included gladatorial games. This is a relief carving on a slate found in Newgate Street. 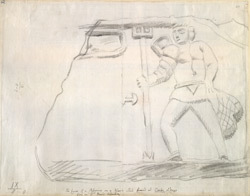 It shows a Retiarius, a type of gladiator who would have fought with a trident and net This is a preparatory sketch for a later print published by the Society of Antiquaries.